A few days ago I answered the question "What is your favorite history resource?" in a blog post titled: My love affair with biographies. Given this, I suppose it is natural that I'd gravitate towards a "historical fiction and biography" approach to history for my kids. When we've been most successful with this, we've been able to have everyone more or less on the same page. The past couple years, however, we've been drowning when it came to history, because we had moved away from all of us doing it together. And then a few weeks ago, I found TruthQuest History. I'm going to confess something here. I didn't plan to like this. I looked over the website, looked over the samples, and I knew it wouldn't work for us. Not enough direction, too cutesy in the commentary, too single-perspective in approach. Not to mention that my kids are just too far apart. I volunteered to review it mostly because people keep asking me what I think of TruthQuest, and I always have to just mumble, "I've heard good things about it, but I really don't know..." and I really wanted to be able to look it over thoroughly so I could give a better answer. Connor really wanted a chance to spend six weeks studying modern history, so we chose Age of Revolution III (world history, 1865 to the present, for 5th-12th graders). When we received it, I read over the introduction, started pulling together resources, and dug in. And we loved it. Even though this is intended for the older kids, there are book suggestions for the little ones too (my littles are K and 2nd). After two days, and a lot of looking ahead on my part (my high school student did a lot of looking through it too) we decided that TruthQuest is what we need for the long-term. So I contacted Mrs. Miller and begged for some help in figuring out a plan of attack for my gang for after this review. The website is fabulous, with a How to Choose section that gives some ideas for plans for starting at various ages. I thoroughly read that, but still contacted TruthQuest. I have to rave about the customer service. Mrs. Miller had a lot going on in her life at the time this review started, including the fact that she was frantically trying to get all the guides into pdf format, but she gave me some incredibly thoughtful recommendations as to how to make this work out for us for the long-term. We ended up getting the Renaissance, Reformation and Exploration guide (also for grades 5-12) and the American History for Young Learners I (for grades 1-5). We switched gears. How it works: Basically, TruthQuest is a combination of a commentary on history, coming from a distinctly Christian perspective, and a resource list. It is not a daily schedule, or even a weekly one. It does not suggest specific hands-on activities often. As a parent, you decide which topics you will dig into, and you choose which to skip entirely. You decide if you want to just read the commentary. You decide if you want to own some "spine" resources. You choose which books to read and how many of them. I did sit down and list out the table of contents in a spreadsheet, and then I took the American History table of contents and tried to match things up for the explorers aspect of it. This also helps me to get a rough idea as to what I might want to start hunting for at the library. How we use this: I already owned one of the "spine" texts for the Renaissance guide (Our Island Story) and a number of the "general resources" (Story of the World, Greenleaf's Famous Men of the Renaissance & Reformation, This Country of Ours). I can get a couple others from the library (Light and the Glory, How Should We Then Live?). I ended up purchasing a couple others (Renaissance and Reformation Times, Story of Liberty, Story of the Thirteen Colonies). Please note: you do not need to own (or use) the spine texts, or the general ones. I look ahead, and put on hold every single resource that my library has from the recommendations provided by Mrs. Miller. The library typically has between 1/3 and 1/2 of the specific suggestions, which means for some subtopics it has nothing. I also check out some of the other resources I have around (mostly ebooks). If I don't have much between those, I decide if I want to dig further, and if so, I'll do a general search at the library. As for the actual teaching, each section starts out with a commentary, which I read aloud to everyone. I do tend to rephrase it a bit as I go, to tone it down a bit. After the commentary, there are usually a number of sections with resource recommendations. We start with the "general information" one (usually the first sub-topic) and we pull out all the resources I have found on that. If there are picture books, I start with those, then excuse the little two. I love picture books. At least good ones. Those authors have learned how to get the most important points into just a few words. We then read the older level books. With some sections, I'll assign a book for my high school student to read, mostly based on his interest level. We just read until we all seem to feel we've read enough. Sometimes that takes a single book (or a chapter out of one of the spines or general resources). Sometimes we end up reading a few books over a couple of days. Then we go on to the next subtopic. Often the second subtopic in a section will be an activity book of some sort. We don't tend to do those. My kids come up with activities pretty well on their own, so I don't tend to add them to our "formal" schoolday. The other sub-points in a section tend to be about individuals or specific events. I think I've mentioned once or twice lately that I love biographies, so obviously I try to make sure we at least read a chapter out of Greenleaf (this book is a collection of short biographies) or something similar. I try to get a biography appropriate for each grouping of my kids (high school, middle school, early elementary) and read those. When we are done, we move on. I cannot begin to tell you how fabulous this has been for us. The kids are once again able to interact about their history, as they are studying essentially the same stuff. I am actually DOING history with everyone instead of short-changing anyone. I hated that Connor was basically doing history without me anymore. I want to be able to be discussing the big ideas, the flaws, the virtues... the "WHY does this stuff matter"... of his history studies. Our plan for the next few years? We'll be working through Age of Revolution I, II and III (and the corresponding American History for Young Learners books, starting after the explorers in the first one) through Connor's high school. Then, we'll jump back and do something else, probably the Middle Ages. Once Connor graduates, the littles should be fine in the regular guides (they'll be in grades 4 and 6). Too "cute" in the commentary. It definitely is, but I just don't read everything verbatim. I actually like the casual-ness of it, so it is just some of the extra "Wow!!!" stuff that I skip over. No big deal. As we actually started using it, I found that I love the energetic feel. Too single-perspective. If I was just reading the commentary, this would be true. But by adding in extra resources, I am adding in other perspectives. I noticed that there is a decent variety of perspectives represented, even in the spine and general recommendations. And since I'm the one in charge of what extras to read anyway, I'm free to add materials from whatever perspective I choose. So we'll be reading some books about the Reformation that are written from a distinctly Roman Catholic perspective, for instance. Not enough direction. Okay, this would have been hard to get past back to when I was new to homeschooling. I would have floundered as a pregnant mom of a 1st grader, plus a 5 and 3 year old. Right now though? I am loving the freedom this offers me. I don't have to spend two weeks studying Gutenberg. We can spend a day and move on. Not enough direction, part II. The other thing I realized as we actually USED this is that this also gives me the freedom to determine things way more tailored to my kids. Right now, that means everyone is pretty much stuck with me gearing it towards Connor. But down the road, I can be sure to focus on the Middle Ages for William. And more importantly, Thomas can spend a year each on Ancient Greece and Ancient Rome in high school (he plans to go into classical archaeology). Not enough direction, part III. Since I am planning to do four years of TruthQuest in 3.5 years for Connor, this "freedom" also means that we'll be able to easily choose to skip through some of the material without messing up a schedule, or feeling guilty that we aren't doing everything. My kids are too far apart. As it turns out, the American History series coordinates incredibly well with Age of Revolution and even with the Renaissance guide, so I can target the little two a bit more with lighter issues, while still doing the deeper, heavier stuff with their big brothers. What did my kids think? I love that it doesn't have to take up my entire day. I can delve into the topics that I want to but I don't have to delve into all the topics. I like that I have some control over what I study. Of course, my mom also has control over what I study too, so I still sometimes have to spend more time on a topic than I'd prefer. I like how they talk about authors, scientists, artists, and composers in the context of the history. So we can decide to read some works by that author at an appropriate time in our studies. So far, mostly we've been doing stuff with art (obviously, this study is called Renaissance, Reformation and Exploration) and that is one Mom is insisting on us doing more with. I'm tracking hours, and I should be able to get some art history credit as we continue through this. William, 7th grade: "I like that we can cover history from a distinctly Christian point of view, without getting bogged down in obsessive amounts of detail." Thomas, 5th grade: "It's fun to be doing things consistently again, instead of Mom always having to decide whose history to get to that day. All the art books were pretty cool. I can't wait to do Rome." Richard and Trina (2nd and K) both basically shrugged and said, "whatever." Richard said he loved the Ships book though, and that he wants to learn about "the inventors and scientists and stuff." Trina mostly seemed sad that we haven't talked about any princesses yet. "But some of the art was pretty." The best part? 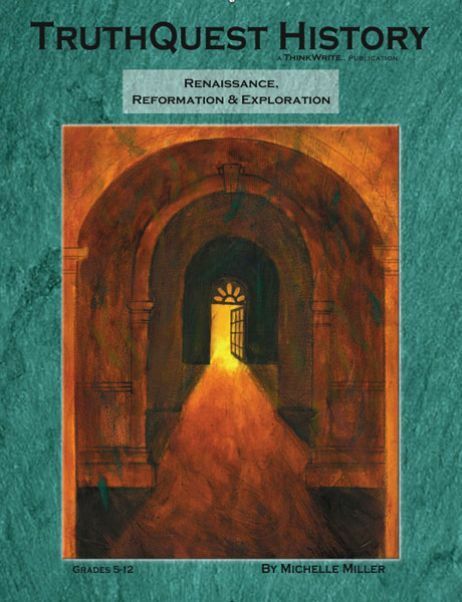 The pdf version of the Study Guide for Renaissance, Reformation, Explorers costs $19.95. All of the guides are now available as pdf (I love that, let me tell you, as I never misplace it) with the most expensive one being $29.95. Print versions are a few dollars more. I spent under $30 on spine texts. This is history I can afford and history I can fit into our lives. This is a serious candidate for my #1 Crew Product for the year. We pretty much like the same things about this program! You said it much better than I did though. The big difference is that I am not using it for everyone, but I'm sending our family in separate ways. Glad to hear your take. I have been waiting impatiently for this review ever since you posted about it coming on facebook. I almost bought it last week, but decided to wait. :) Now, I know I'm jumping in to a good thing. Perfect fit for us. I am a box checker! Not sure how to not stress myself out without the boxes to check off!